Applocker is a part of Windows 7/8 Enterprise. It allows an entire organization to eliminate malware. It is seriously that powerful! It works by whitelisting, or allowing, a specific set of trusted executables to run. Once setup, AppLocker is easy to manage. 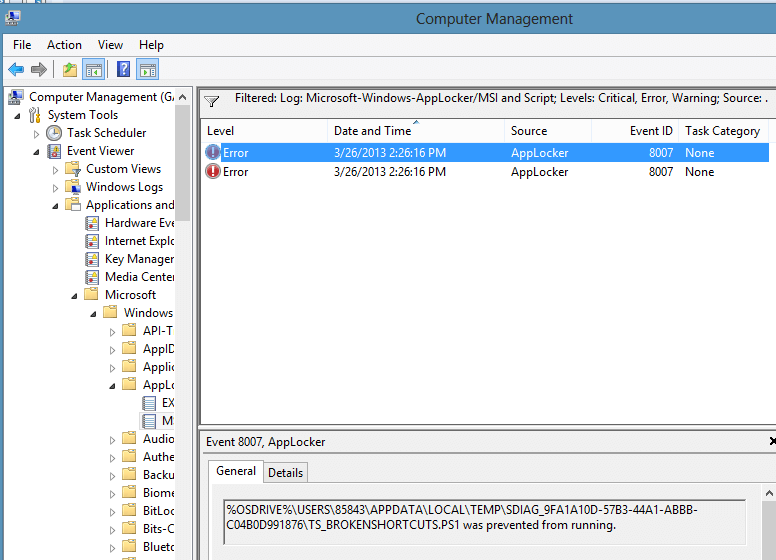 However, if an untrusted executable is ran, you still have to search the event log to gather the AppLocker Errors. Now imagine opening up the event log for multiple machines! Not fun at all! To help aggregate these logs, we are going to use PowerShell! There is a plethora of information in Active Directory and Group Policy. Every new release of Server simply compounds this information. 9 times out of 10, everything you will ever need is on TechNet. Finding it is the problem. To make sense of this overload and to find exactly what I want when I need it, I use these two tricks.